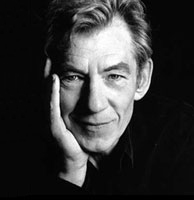 Biography: Ian McKellen is among the most acclaimed actors of his generation, honored with more than forty international awards for his performances on stage and screen. He was born in the industrial north of England on May 25th 1939, the son of a civil engineer. He first acted at school and at Cambridge University where he studied English Literature and appeared in 21 undergraduate productions. Without any formal dramatic training, he made his professional debut in 1961 at the Belgrade Theatre in Coventry and for three seasons worked his apprenticeship with other regional companies, culminating with the opening of the Nottingham Playhouse, where he was directed by his childhood hero, Sir Tyrone Guthrie. His first London appearance in A Scent of Flowers (1964) won him the Clarence Derwent Award and an invitation from Sir Laurence Olivier to join his new National Theatre Company at the Old Vic Theatre. This was followed by two seasons with the touring Prospect Theatre, storming the 1969 Edinburgh Festival as Shakespeare's Richard II and Marlowe's Edward II. These played for two sell-out seasons in London and were televised. His Hamlet followed and established McKellen as "the leading classical actor of his generation." In 1972, he co-founded the democratically run Actors' Company. His work with the Royal Shakespeare Company at Stratford-upon-Avon and in London (1974-78) included plays by Brecht, Chekhov, Ibsen, Marlowe, Shaw, Stoppard and Wedekind. He played Romeo, Macbeth, Leontes, Toby Belch and Iago for Trevor Nunn. On Broadway, he won every available award, including the Tony for Best Actor, as Salieri in Peter Shaffer's Amadeus (1980-81). At the Royal National Theatre, where he is a member of the Board, his hits include Wild Honey, Coriolanus, The Cherry Orchard, The Critic, Bent, Napoli Milionaria, Uncle Vanya, An Enemy of the People and - in 1998 - Captain Hook and Mr. Darling in Peter Pan. As Richard III, he toured the world from Tokyo to Los Angeles and for the acclaimed movie version, which he co-scripted Globe nominee for Best Actor (1996). His solo shows Acting Shakespeare and A Knight Out have toured the UK, Europe and the US raising funds for local charities. His first starring role on television was in David Copperfield (BBC 1966) and in the cinema as D.H. Lawrence in Priest of Love (1980). Other on-camera successes include Scandal, And The Band Played On (Emmy nomination and Cable Ace Award), Cold Comfort Farm, Rasputin (Golden Globe Award), Bent and Swept from the Sea. He also starred in Apt Pupil by Bryan Singer and will appear in the upcoming X-MEN 2 from the same director. His performance in Gods and Monsters has earned accolades from around the world, including nominations for the Golden Globe and the Academy Award as Best Actor in 1999. Sir Ian was knighted in 1991 for his services to the performing arts.  "I am encouraged by the theatricality of [Tolkien's] readings -- full of rhythm and humour and characterisation. Without question Gandalf is like Tolkien but then so, I suspect, are Frodo and Aragorn."  "Many unthinking people just don't like the idea of gays joining in their games, nor in the military and, it would seem, in the movies." Ian McKellen recently visited New York and spoke to us about filming FOTR, working with Ian Holm, and gave us a few exciting details about The Two Towers!